Funny how quiet the green-crapping Kyodiot Gorzukion climatalarmists (Al Gore, David Suzuki, Stephane Bumbledore Dion, et al) are about all that good ole man-made global warming we've been having this winter. But by about mid-March we can expect the Gore-bull warmers to 'spring' their socialist-climate-fear-agenda back to the surface again; for now, it's on ice, buried under all that snow, er, Gore dandruff. Yep, they'll keep on shovellin' it. Even Evironment Canada "senior climatologist" Dave Phillips is doing his best to coast through this winter without contradicting himself. "Re: All MPs should drive fuel-efficient domestic cars, The Standard, Dec. 19. I read with great amusement this letter to the editor recommending that we encourage our MPs to buy fuel efficient Chevrolet Aveo cars in order to help fellow Canadian workers. I was wondering exactly how helpful it will be to our fellow Canadian workers to buy the Aveo, which was designed in Italy and is built by Daewoo in Bupyung, Korea. But there is a drawback to focusing on 'Canadian-made' ONLY BECAUSE it's Canadian-made (union or not), rather than on product quality and value. If we are to favour protectionist tendencies, then quality can be overlooked as a secondary matter. If we are to follow a competitive model, then the marketplace can (and should) decide what it is willing to pay for. Foreign-built Aveos masquerading as 'help-save-GM' products should be allowed to compete with Canadian-built Toyota Corollas or Honda Civics; and some consumers might even decide to buy an Aveo over a Toyota or a Honda. But the question is, why should the federal and provincial government give GM billions to enable this kind of obvious, typical Big Three bait-and-switch tactic, anyway? If anything, the multi-billion-dollar-Big 3-bailout should mean the permanent restriction of all fully foreign-made imports; otherwise, what's really the point of this bailout - coddling the comfortable status-quo and postponing the inevitable??? Why should General Motors get billions of tax-dollars to sell freakin' Aveos to Canadians?! Can Liberal Jim Bradley, Ontario's Transportation Minister, explain that? “Just in time for the busy holiday season, and very quietly, the province killed any brewery's claims that it is peddling its wares for a buck a beer. The minimum price that can be charged for a case of 24 bottles of beer in Ontario is now $25.60, including deposit, an increase of 6.7 per cent approved by the Liquor Control Board of Ontario in October. An increase of $1.60 per case isn't debilitating by any stretch, particularly when the product in question is a luxury like a case of beer. But the optics surrounding this decision warrant a deeper discussion about our province and society. It is deeply concerning that this price hike from the LCBO, on a recommendation from the Ministry of Finance, was carried out in the shadows. The ministry sent a memo recommending the price hike to the LCBO meeting of Oct. 15. Within 30 minutes, and with minimal discussion, the increase was approved. It took effect Nov. 24. The price floor also applies to coolers and low-alcohol spirits. But outside of the minutes recorded for that board meeting, there was no public notification of the pending change in the price of a case of beer. The LCBO said it doesn't issue news releases regarding price changes, which is curious operating procedure for a customer-service driven business. This decision was made out of the glare of the media spotlight, and little rationale has been offered justifying the decision. It will boost the bottom lines of the breweries and the province, but hits consumers struggling in a tough economy. But just as troubling as the circumstances surrounding the decision is the spectre of the nanny state lurking behind the need for a minimum price for a case of beer. The LCBO established a "social responsibility" mandate in 1993, and uses the price of its products as a tool for controlling alcohol consumption. The implication is clear: The average person can't be trusted to drink responsibly if the price is set too low. In other words, the government knows what is best for you, and will impose its will by charging more for the products it sells. The Liberal gods are all about imposing what is “best” upon the lessser mortals. There is nothing “odd” about that. Liberals portray themselves as saviours of a helpless humanity. The best thing, for Liberals, is that they earn their living by spending our money – for our own good! When it comes to further articles about Nanny-State Liberals, will the Standard keep the sentiments found in this editorial in mind, as future issues arise similarly in the Liberal’s nanny-state health-care monopoly, as well? It’s bad enough that Jim Bradley and his meddling Liberal elitists decided to increase the price of beer in their alcohol monopoly; but the Standard might consider what its editorial response would be if Bradley’s Liberals decided next that - for our 'own good' (naturally!) - only one kind of beer will be allowed in Ontario! After all, OHIP is nothing more than a government-run monopoly, same as the LCBO (Liquor Control Board of Ontario) government-run liquor monopoly; so as with state-run health-care, less choice and more government-control is better, right?! It’s pathetic that Ontarians have been trained to suckle at Nanny Jim Bradley’s magnanimous proverbial Liberal teat, and seemingly cannot be weaned off their dependence on duplicitous Liberal promises and elitist Liberal ideology. 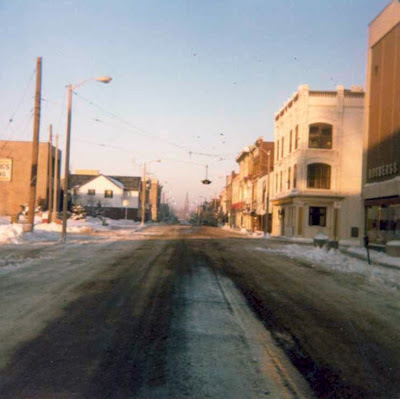 Below: looking west along Queen St. in Niagara Falls, Ontario, taken on a snowy February day in 1978 from the east side of Erie Ave. Rosbergs Dept. Store is at the right corner of photo. below: Looking at north-west corner of Queen St. and Erie Ave. Note streetcar travelling on Queen St. Date of photo not known. above: same view, Dec.22, 2008. The building on the corner, seen in the last four photos, was built in 1894, and housed the Bank of Hamilton from 1902 to 1924, then the Bank of Commerce from 1924 to 1961, then it became the Canadian Imperial Bank of Commerce (CIBC), from 1961 to 1984. Since then, it has housed a succession of retail stores. 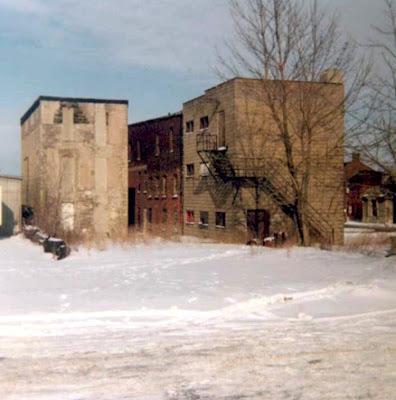 Looking at the right side of the photo, the building is angled along the rear-side, because it had been built parallel to the Michigan Central railway tracks which had crossed Erie Ave. at that angle, where the car is seen parked at the right. 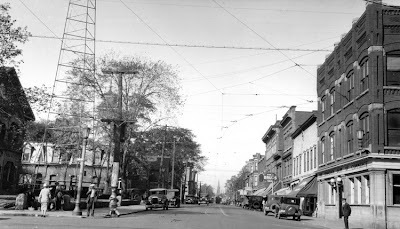 below: 1927, looking west down Queen St.; the south-west corner of Queen St. and Erie Ave. is on the left. The then-Bank of Commerce building is seen at the right. At the far left, the building with the large gable is the old Niagara Falls City Hall. Behind the tall radio tower, behind the tree, can be seen the Niagara Falls fire station with its own lookout tower. above: same view, Dec.22, 2008; at left is the remodelled-'old' Niagara Falls City Hall, now sealed up and vacant; the current City Hall is located behind it and to its left, out of view. In both shots, St. Patrick's church steeple can be seen in the far distance at the west end of Queen St. where it meets Victoria Ave.
below: looking north-east along Erie Ave., from across Queen St. A streetcar is seen turning the busy corner from Queen north onto Erie Ave. This is the corner (on the right; east) where the Rosbergs department store would later be built up; in the distance in both photos below can be seen the outline of the row of shops which faced onto the east side of Erie Ave. Before it was Rosbergs, the corner building was the Armstrong hotel. 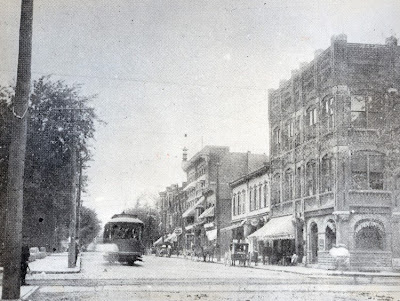 The corner of the old Bank of Commerce building is located just out of frame, immediately to the left of the turning streetcar. 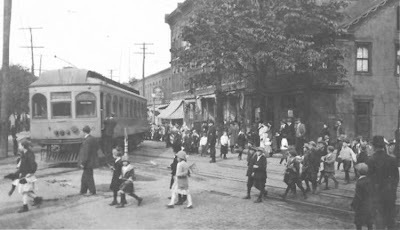 If you look at the bottom right, you will see a line of children crossing Erie Ave., walking over tracks: these are the Michigan Central railway tracks, which are clearly seen cutting across both Queen St. and Erie Ave. at an angle; the Bank of Hamilton/Bank of Commerce building had to be built with that angled cut at its rear, to accommodate these tracks. So in this photo, the streetcar is on its own separate set of tracks, which are crossing two sets of railroad tracks. above: same corner, same view, seen Dec.22, 2008, with the abandoned Rosbergs at the right. below: looking at south-west corner of Queen St. and Ontario Ave., taken 1919. This building was built in 1915 by the IOOF Lodge 53, which had used the upper floors and rented out the ground floor; in the 1930's, the Imperial Bank had a branch here, at 388 Queen St. The Odd Fellows sold the building in 1975.
above: same view, Dec.22, 2008, green steel-cladding removed. 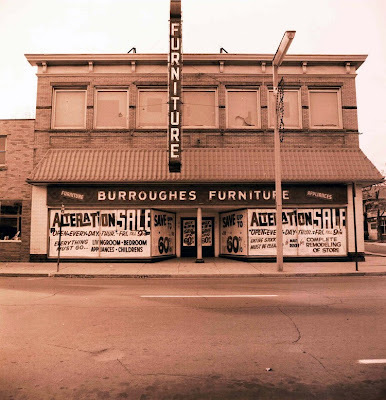 The current address is 4554 Queen St.
below: same Burroughes Furniture building as seen from the front, on Oct.4, 1964.
above: same view April 2014, Google image. 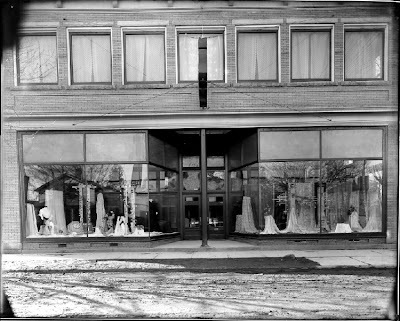 Cupolos sporting goods store had relocated here for a short time, as well, after they had closed their long-time location on Ferry St., near Stanley Ave.
above: Before it was home to Burroughes, the same building was home to Northcott's Furniture, as seen in above photo taken in 1930. Not sure if the sign is going up or being taken down. One would think that the chances are that the folks would be posing to commemorate their new neon sign about to go up! Note to the far left (east) a bit of house is seen, next door on Queen St. - this was the home and office of Dr. Alex B. Smillie and his wife, Adeline, at 544 and 548 Queen St. (now Moodie's Bakery is on that site in a newer building; at some point the Smillie houses were torn down). Though I don't know how long he had been there, I have confirmed that Dr. Smillie was listed being at this same address on Queen St. in 1932, inclusively up to 1955 (...and he was probably there before 1932 and after 1955!) His office and home telephone number (in the 1930's) was a 3-digit number "244"!! 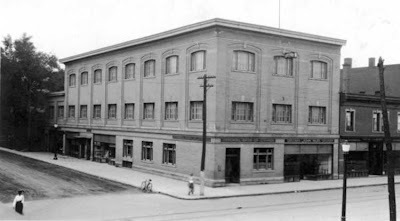 Interestingly, in 1932 (this building's address at the time was "554" Queen St.) the occupant here was listed as the "Kotex Co. of Canada" whose manger was a John L. Sensenbrenner, who lived across the river in Niagara Falls, N.Y. S. I wonder if this was a branch office of theirs, or perhaps some kind of factory or warehouse? 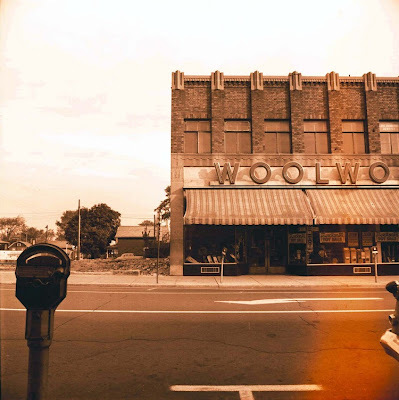 Also this again brings up the question about the above 1930 photo: was that Northcott's sign being taken down, or being put up?? If the Kotex Co. was already at 554 Queen St. in 1932, how long had Northcott's been there - less than 2 years? There was no listing at all for Northcott's Furniture in 1932. Did the depression put them out business? 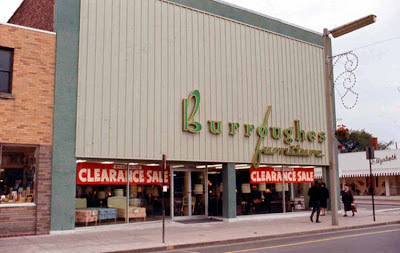 In 1932, the FC Burroughes Co. was already in Niagara Falls, but they were located at 400 Queen St. at that time. 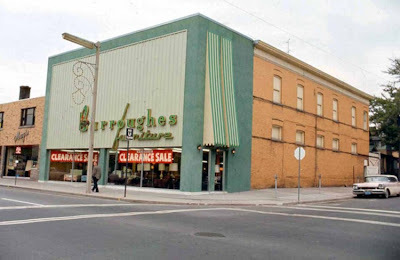 In 1933 the FC Burroughes Co. purchased the existing building at 554 Queen St. (former location of Northcott's, and of the Kotex Co.) and remodeled it into a 15,000 sq. ft. showroom. So both Northcott's and Kotex ended up being short term occupants here. 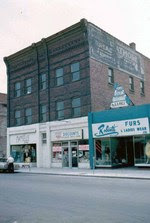 above: same view, 1920 - before Northcott's, this same building at 554 Queen St. was home to C. Wallace and Co. Dry Goods. 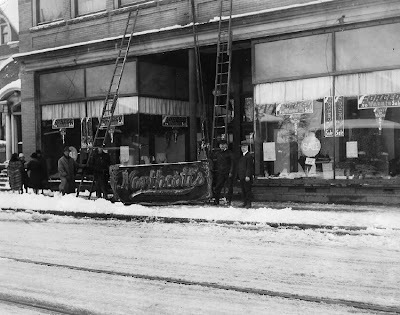 Wallace's at some point later (before 1930) moved across the street, to a building (481 Queen St.) on the north-west corner of Queen and St. Clair (see: here, scroll to end). 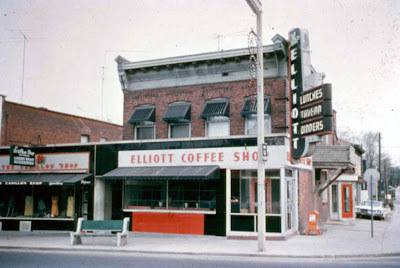 below: Oct.4, 1964 - looking at the north-west corner of Queen St. and Crysler Ave, occupied by the Elliott Coffee Shop, with its fantastic corner neon sign overhanging the sidewalk. Seen in the right distance is the old electric-generating station of the Niagara Falls Electric Lighting Co., which stood on the south-east corner of Park St. and Welland Ave. (note: today's Crysler Ave. was formerly known as Welland Ave.) This station had been built in 1895 and was demolished during Nov.17-19, 1969.
below: the Elliott Coffee Shop in an undated colour view, with the Carillon Shop at the left. above: same view, Dec.22, 2008. The building became for a time the Daily Planet bar, and is at this point in time operating as the Orchid. The former Carillon Shop (seen above) and the next building to the left have been melded into the larger tavern. below: date not known; looking at the south-west corner of Zimmerman Ave. (formerly known as Clifton Ave.) and Park St. 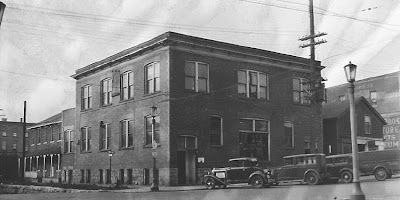 This was the Niagara Falls EVENING REVIEW newspaper office, F. H. Leslie Ltd.. The former Michigan Central railroad tracks ran behind the building crossing a bridge over Zimmerman at the left of photo. In the far left distance is the top of the hat factory which later became the King Edward Hotel [located on the south-west corner of Queen St. and Zimmerman Ave., see also: Niagara Falls, Then and Now: the Eastland shed ] The building at the far right (with the advertisement painted onto its side wall) was the building that later became St. Jude's shelter for homeless men (seen further below in this post). Hard to imagine that this derelict area was once the vibrant center of Niagara Falls, near two major train stations and two bridges crossing the Niagara River from the United States, near all the main stores, banks and government offices. 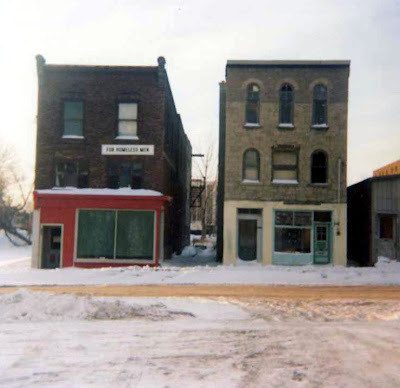 below: the St. Jude's homeless men's shelter as seen on a snowy Feb. 1976 - 226 Park St. was at the left; 232 Park St. was at the right.These buildings were demolished in May 1976. This view looks at the south side of Park St., these buildings were just west of where the Niagara Falls Evening Review building had once stood at the south-west corner of Park St. and Zimmerman, as seen earlier above. The building at the left was the one with the advertising painted on its left (eastern) wall. At the lower far right of the photo below can be seen the corner of the Eastland Shed, mentioned earlier above. Peeking above the Eastland Shed's roof (at the far mid-right of the photo) can be seen a sliver of the top of Rosbergs Department Store. above: Dec.22, 2008 - same view looking south across a snowy Park St. where the St. Jude's houses had once stood, the land long since vacant, now used as a parking lot, and a place for the city to dump snow. At the far-right, the top of the now-vacant Rosbergs can now be fully seen, because the Eastland Shed has been demolished. The now-abandoned Michigan Central rail right-of-way (with the same oddly-bent trees running by the tracks, as also seen in the 1976 photo) can still be clearly seen stretching across the centre. below: this photo was taken while standing by the railroad tracks, looking back at the rear of the same two St. Jude's houses (which fronted onto Park St.) in Feb. 1976. To the right can be seen a bit of Zimmerman Ave.; the small stone building at the far right centre of photo is part of the grand Federal building, which was built in 1883. It held the Customs and Post Office, and later police station, but has sadly sat abandoned and vacant for decades. (see: Niagara Falls, Then and Now: The old Post Office) At the far-left is seen the south-east rear corner of the Eastland Shed. above: This is the same view, looking from the rear towards Park St. where the St. Jude's buildings once stood on the now-vacant lot. This view is from the rear south-west corner of Park and Zimmerman, and is looking across to the north-east corner of the same intersection, where the old Federal building stands. The small stone building (seen also in the previous 1976 photo above) can still be seen on Zimmerman Ave., standing to the north of the abandoned Federal building. In both above photos can also be seen the gable and chimney of the building further to the north along Zimmerman Ave, which for years was a custom broker's office. So, the United States Consulate office had moved from Park St. to the Newman Hill location at some point between 1932, and 1938. In 1949 the American consul at the Newman Hill location in Niagara Falls, Ontario, was Arthur R. Williams. above: same view, Dec.22, 2008. Note faded ghost advertisement painted on wall. ("Eat More Bread, Gay Brothers") The store on the right (west) side of the white-painted building was once a Gay Brothers Bakery location. 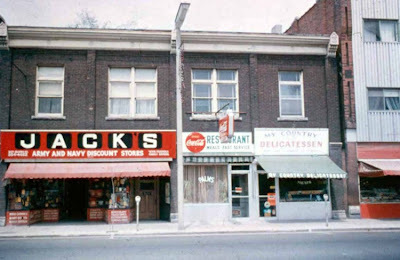 In Apr.1937 the phone number to Gay Bros, at 414 Queen St., was "280" - three digits!! They were listed in an advertisement as having 35-40 employees, with a yearly payroll of $37,000!! Below: Oct.4, 1964 - looking at north-east corner of Queen St. and Crysler Ave., where Swalm's Television Sales and Service is seen, at 559 Queen St.; in 1955 there was a Derrick's Appliances there. 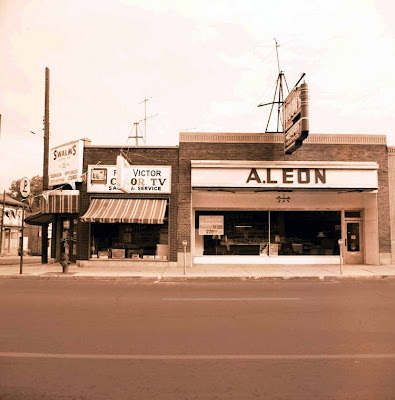 Next is seen a Leon's Furniture storefront at 555 Queen St. Leon's (founded in 1909 in Welland Ont.) has since become a major big-box furniture retail chain, and is celebrating its 100-year anniversary in 2009! Earlier, in 1945, there was a Loblaw's there. below: looking at the north-east corner of Queen St. and St. Clair Ave. at the Capitol Theatre building (formerly Queen Theatre) prior to its demolition in 1964 (date of photo unknown, possibly summer 1964) to allow construction for a new Lincoln Trust building. At the far right can be seen the west-end of the neighbouring Woolworth building. below: At the left is the vacant site of the demolished Capitol Theatre building, before the Lincoln Trust building was built. To the right (east) next to the vacant lot is the west end of the Woolworth's store, as seen on Oct.4, 1964.
above: same view, Dec.22, 2008: the modern 'new' bank building stands on the site of the old Capitol Theatre, contrasting to the remnants of the deco upper facade of the former Woolworth's building. 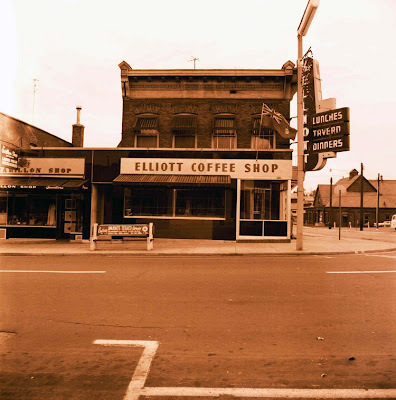 below: Looking at the north side of Queen St., just east of Ontario Ave., as seen May 5, 1965. 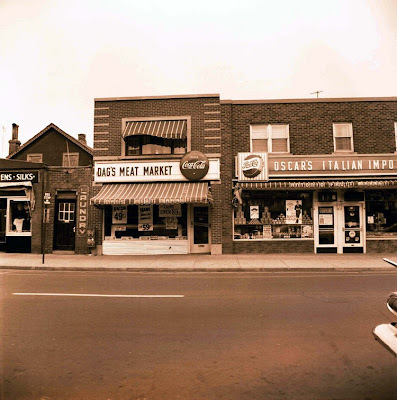 Queen St. was really a bustling retail hub; with many major chain merchants as well as smaller shops and services represented throughout the strip from Rosbergs at the east end of Queen, to Loblaws and Eatons at the west end along Victoria Ave. It was a shopping destination where customers could browse the street shops for an entire afternoon. It was what malls today attempt to recreate. 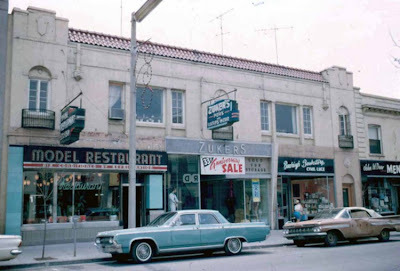 above: same view, the little Palms Restaurant, along with its overhanging Coke sign, is gone, but the family-run My Country Deli still remains. 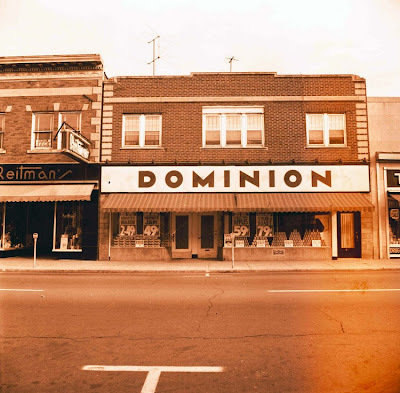 below: Oct. 4, 1964 - looking at the Dominion grocery store (501-503 Queen St.). At the far left (to the west) is Reitman's women's wear shop. 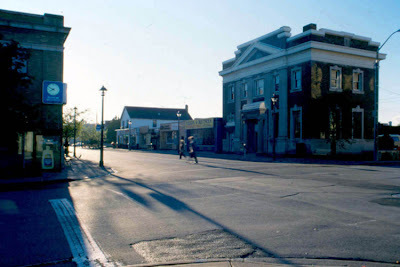 below: looking at the north-west corner of Queen St. and Ontario Ave., May 1965. Rainbow Bowling Lanes had a nice neon sign overhanging the sidewalk on the corner, the bowling entrance was at the side door with the curved glass block. 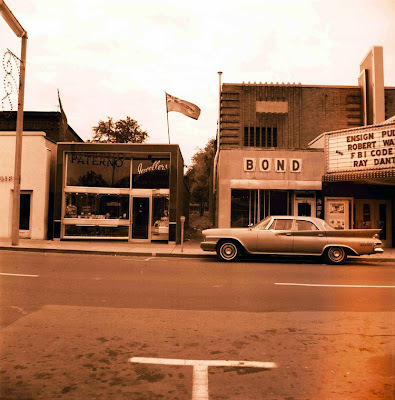 Lane's Restaurant and Soda Bar was at the west end, and Robert's jewellery and china was on the corner. 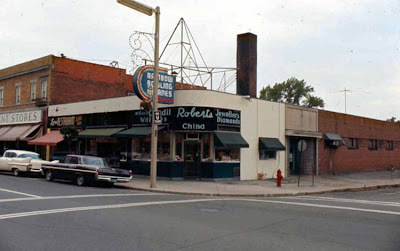 Robert's is still on Queen, having relocated to the south side nearby across the street. Note the black Meteor and tan finned Pontiac (?) parked out front! That's audacious automotive style for you! above: the same view on a dreary Dec.22, 2008. The building has been stuccoed and became an office. 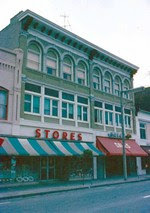 The building to the left, once the Giant store, is now vacant. below: looking at the south-east corner of Queen St. and Ontario Ave. in Sept. 1986. Bank of Montreal is at left, and a federal employee credit union was at the right; earlier, this was the Dominion Bank. above: same view, Dec.22, 2008. Canopy of the Bank of Montreal building is seen at far left. below: looking at the south side of Queen St., between St. Clair Ave. and Crysler Ave., May 1965. Check out the beat up brown Pontiac convertible! above: same view, Dec.22, 2008. to the far left (east) is seen a bit of the corner of the Canadian Imperial Bank of Commerce building. To the east of the CIBC stands the federal Post office building. the former Model Restaurant has become the Hi-Lite Restaurant. below: looking at the south side of Queen St., between Crysler Ave. and St. Lawrence Ave., Oct.4, 1964. 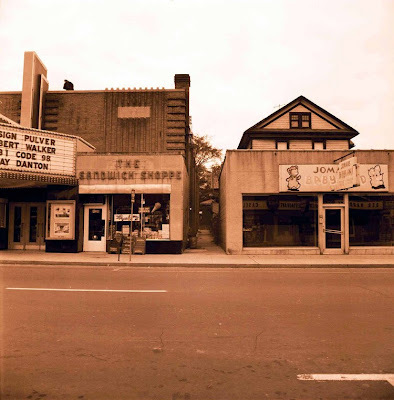 Paterno jewellers is seen at the left, the eastern half of the Niagara Falls Seneca Theatre at the right. 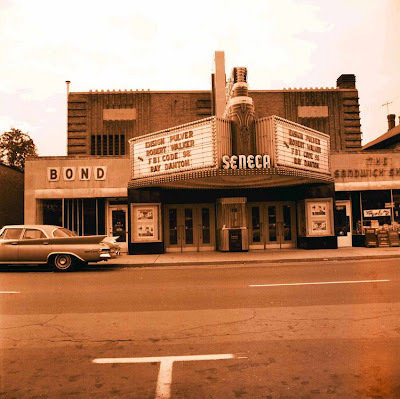 It was here at the Seneca that the Canadian premiere of the movie Niagara, starring Marilyn Monroe, was held in 1953. Another fin-tailed wonder is parked on the street in front of the movie theatre. above: same view, Dec.22, 2008. The brilliant red vitrolite trim combined with gleaming stainless steel accents on the old Paterno shop grabbed the eye of passersby. below: the fabulous Seneca Theatre neon marquee as seen in its glory days, Oct.4, 1964.
above: same view, Dec.22, 2008, forty-four years later - on this dreary December day, the past glory of the Seneca is but a distant memory. . .
below: the west side of the Seneca, where The Sandwich Shoppe was located. above: same view, Dec.22, 2008. New shops are emerging once again to breathe life into downtown (but most didn't last long). below: Oct. 1966 - looking at the Metropolitan Stores building on the north side of Queen St., between Ontario Ave. and Erie Ave., directly across the street from Niagara Falls City Hall. below: Oct. 1965, looking north-east along Valley Way towards Victoria Ave. Note the electric blue sky! 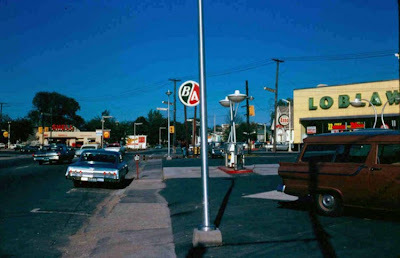 Visible are three gasoline stations - a B/A , an Esso, and a Shell. At the right is the huge green neon lettered sign, on the pale-yellow vitrolite facade of the Loblaw's grocery store. above: same view, Dec.22, 2008 - the Loblaw's building later became a Canadian Tire store for many years. By 2017, it had been remodeled into a community health center. below: Oct. 1965, looking north along Victoria Ave. at the Bender St./ Palmer Ave. curve. 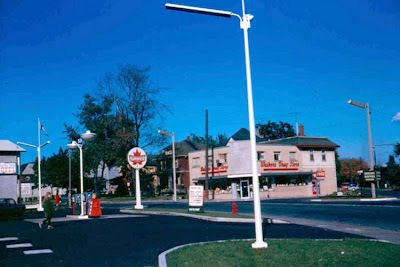 The Supertest gasoline station was on the west side curve of Victoria Ave., north of Hunter St.
above: same view. Where the drug store was on the corner now is a large Japanese food restaurant. A hotel has been built on the gas station site. below: Oct. 1965, same Supertest station, looking south, as Victoria Ave. curves around to the right. 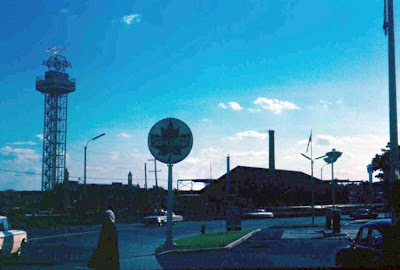 The then-Oneida (later Kodak) observation tower dominates the skyline at the left. The built-in-1962 Seagram Tower (today's Minolta Tower) can be seen peeking up at the far bottom right. above: same view, Dec.22, 2008. A hotel occupies the corner at the right. The Oneida tower is now closed, and is a giant advertising beacon for the casino, with a hotel having been built beside it. The Minolta Tower is today out of view from this area, surrounded by high-rise hotels. Thanks for visiting Right In Niagara !